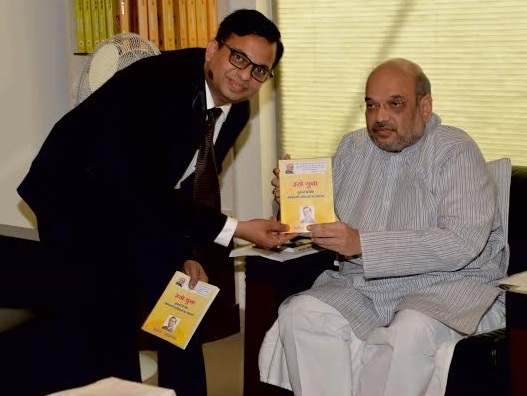 Shri Amit Shah, National President of BJP released ‘Utho Yuva’, a collection of inspiring poems written by Shishir Srivastava at the BJP’s Headquarters today. The author of ‘Utho Yuva’ Shishir Srivastava, is a Motivational Speaker, Author, Poet and Career Counsellor. He was born on 26 September 1977 in Lucknow to Dr Sushil Kumar Srivastava and Mrs Neerja Srivastava. Srivastava’s first poems appeared in The Times of India when he was 16 years old. He has authored four books. His first book ‘The Eight Powers Within You: Your Guide to Success’ (Penguin Books, June 2010) appeared in the Indian Today’s non-fiction bestselling list within two months from its launch and has been translated in four languages. His second book ‘The Power of Prayer’ was published as an eBook in 2011. In 2013-14, he co-authored ‘Youth for Youth’ with Dr Kiran Bedi, an e-book which contains voices of 101 young men and women on the issues of ‘Corruption’ and ‘Women Safety’. “Utho Yuva” is his fourth book. Mr Srivastava has been playing an important role in motivating people through his speeches and writings and helping them choose a right career path. He has visited 12 countries and has addressed audiences internationally at various conferences. In July, 2005 and in September 2014, he participated in UN Conferences at the UN Headquarters, New York and has addressed the Parliament of World Religions in July 2004 in Barcelona, Spain. In 2012, he was invited to deliver a lecture at the University of Oslo in Norway. In 2013 and 2014, the MGPU Russia invited him to address International Conferences on Social Capital in Moscow. In 2009, Mayor Dr Dinesh Sharma presented him the ‘Young Communicator Award’ in Lucknow (an award constituted by the Symbiosis Institute of Mass Communication, Pune). In 2012, Prof. Madhvan Menon presented him ‘Man of the Year Award’ in Chennai (an award constituted by the Justice TLV Iyer Foundation).